Idea, Information, Pattern How To's, Step by Step Instructions, Photos Included, for how to make/craft/build/diy, do it yourself/handcraft your own Pannier ~ Scroll Down ~ I have information below on how to make your own Saddle Bags, one piece two Panniers, as well as Individual Panniers made using Feed Bags~GO GREEN, as they say <more photos coming soon>. I HAVE PATTERNS, IDEAS AND INFORMATION BELOW FOR MAKING/CREATING/SEWING/CRAFTING YOUR OWN BICYCLE PANNIERS AND BIKE BAGS, DIY, SEE FAR MORE IDEAS AND INFORMATION AS WELL AS PATTERNS AND PHOTOS FOR MAKING ALL SORTS OF BICYCLE PANNIERS AND BAGS FOR YOUR BIKE AS WELL AS FOR YOUR CHILDREN'S BICYCLES ON OUR "MAKE YOUR OWN BICYCLE PANNIERS" PAGE AT THIS WEBSITE, SEE NAVIGATION AT THE RIGHT. OF COURSE YOU CAN BUY PANNIERS, FANCY EXPENSIVE OR EVEN INEXPENSIVE BICYCLE PANNIERS, OR YOU CAN HAVE SOME FUN AND MAKE YOUR OWN! 1. Baskets ~ Either made for bikes or purchased at a Thrift Store, maybe even one your mother is getting ready to throw out in the trash. 2. 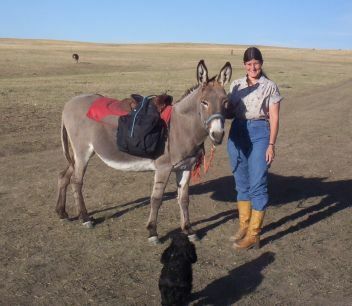 Horse or even Pony Saddle Bags ~ You will have to "work them over" to fit the bike and add velcro, but you can use a new set or the old ones you have hanging around in your tack room. 3. Suitcases ~ If you can find two, light weight, good shape, non stinking, that match at a Thrift Store, you have found GOLD! 4. 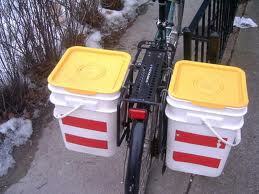 Kitty Litter Buckets ~ there are many websites that give the plans and instructions for making these hard sided Panniers. You can also buy Kitty Food in these buckets as well as find them in colors new. For a smaller framed person, these can double as seats in camp. They can also be used for little tables. 5. 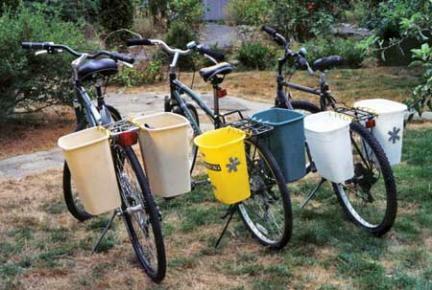 5 Gallon Round Buckets ~ These won't lay as flat to your bicycle as the square buckets, but will work and keep your items from be crushed, that is, if you pack them correctly. For a smaller framed person, these can double as seats in camp. They can also be used for little tables. 6. Storage Tubs ~ of different sized and shapes bought from Discount Stores. Chose the shape and size you need for the type of items you will be carrying. 7. Small Feed Buckets ~ However, you will need to make these some sort of lid, or use them with an Open Top. 10. Plastic or Corrugated Plastic ~ There is a guy out there that makes Fenders and Panniers out of Political Corrugated Signs. 11. Duck Taped Cardboard Boxes ~ Choose your colors and have fun covering the box. However, be careful, the duct tape does not make the sides of your box much more hard or stable. 12. Ammo Can ~ Metal is heavier than plastic, both are waterproof. 13. Milk Crates ~ Ask before removing these from Store or Restaurant Parking Lots. 18. 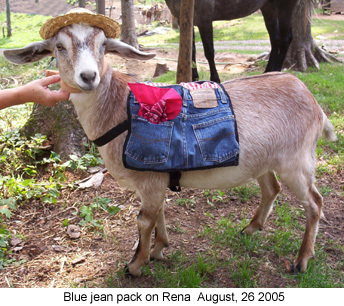 I used to make Dog and Goat Backpacks out of a Pair of Jeans, using the front of the pants on one side and the back of the pants on the other. 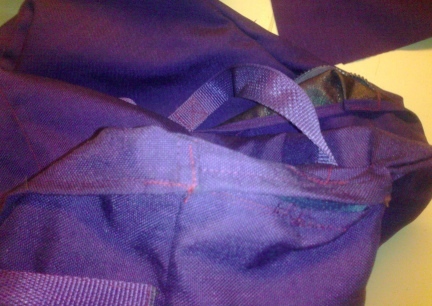 The pockets were used for items carried too. 23. I would warn you against using glass items but a One Gallon PLASTIC Jar, could be adapted to make a carrier for your bicycle. Look around your garage or at Garage Sales, Thrift Shops or the Recycle Bin and see what you can find. 24. Two Large Cooking Pots ~ new or used could be used for Panniers. However, if you were going to use them for cooking in camp, make an outside pouch for each to attach to your bike. That way there will be no holes in your pots. Metal Pots might need to be lined also, or they might make a lot of noise going down the trail. 25. Two Popcorn Buckets ~ Those large metal popcorn cans with lids. Most have very nice decor on them. Again, you might want to muffle the inside of these to quiet them on the trail. 26. Two Matching Tote Bags ~ You can buy these with Store Names on them or in prints and colors. 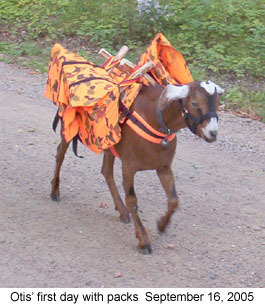 They could easily be made into Panniers, add velcro closures across the tops for a way to keep them closed as you ride. 32. Clean, preferably new, small sized Trash Cans. 33. If you could get a hold of some, legally, those Plastic Shopping Baskets most stores offer customers to carry and use for items they are purchasing. 34. Two Lap Top Cases. You can buy these for a couple of bucks at Thrift Stores. And Laptop Cases used as Panniers would be quite handy if you are taking your Laptop with you on your bike rides. 35. Two of those nice clear plastic cases with zippers that bedding comes in. Call them, Clear Plastic Bedding Zipper Bags. 36. Two matching Rifle Cases. 37. Two Hard Cases Guitar Cases. 38. Cut the top off of a Milk Jug, that is leaving the handle, just cutting the pouring area off. Attach easily to your Rear Rack. 40. Light Weight Wooden Boxes. 41. Wicker Baskets with lids. 43. Hard Sided Insulated Coolers, smaller of course. 44. Soft Sided Sided Insulated Coolers. 45. Stuff Sacks or call them Pouches from Sleeping Bags. 46. Two Liter Bottles with the top cut off. Use open or make lids for them. 48. Small Animal Pet Crates. 51. 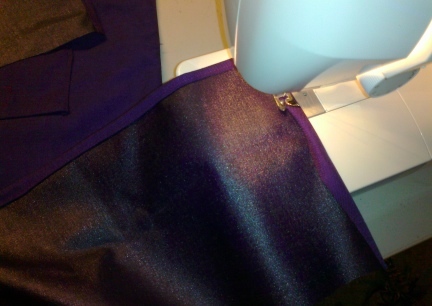 Use Vinyl Fabric or Table Cloth Fabric to make Panniers. 52. First Aid Kit Boxes. 53. Hard Sided Gun Cases. 54. Plastic Shoe Box Storage Containers. 55. Large Sized Empty and Cleaned Drink Mix Plastic Jars. 56. Those Bags used instead of wrapping gifts. I would cover them with clear packing tape to make them sturdier. 57. Make Up Cases, the large ones of course. 58. Ice Cream Makers when the cranks and or churns break on them. 59. Empty Plastic Coffee Cans....for smaller loads. 60. Large Coffee Thermos....for small thin loads or coffee for the road. 61. Canoe Trip Dry Bags. 63. 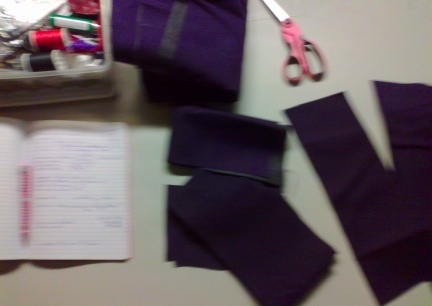 Take a Yoga Mat and some duct tape and have a lot of fun putting together a set of panniers. These will be light weight, will let a bit of air threw, come in many colors and would be just plain fun to make! 65. Insulated Grocery Store Tote Bags. Many Grocery Stores sell toes bags that are insulated used to carry Ice Cream and other cold items home. Two of these could be used for Bike Panniers that would insulate your items as you ride. 66. Sewing Kits, the large older ones that is, some are baskets, some are hard plastic, could be used and would have areas to separate small items. 68. Large Easter Baskets, buy these from Thrift Stores out of season for less than $1 each. Use them open or make a cover for them. 70. Those Bird Houses you make or paint yourself....take the roof off one side and add hinges for the lid. It may not hold a lot, but could be really cute if done correctly. 71. Post Office Mail Room light weight corrugated plastic boxes....IF you can get them legally. 72. Knit or Crochet a couple of Panniers, but line them with fabric so that items do not fall out as you ride down the trail. 73. If you can talk the Construction Crews out of it, Used Snow Fencing, with zip ties to hold it together, could make a nice pair of Panniers for the right type of Trail Riding and the right type of load. 74. Military First Aid Pouches will work for some loads. 77. Men's Shaving Kit Bags. 79. Building Compound Mixes Buckets. 81. Tool Boxes, these lock really well with a pad lock, just remember the extra weight it all will add. 82. Clean or new Kritter Keepers. 83. Store Hand Baskets. You know, those Baskets by the door that you put your items in when you do not need a cart. Can you buy these? 87. Styrofoam Boxes....not such a good idea. They are not made well and can break easily. 88. Take a Dog Treat Box, emptied and cleaned, and a roll or your favorite Duct Tape and line the inside and out with tape that overlaps. Carefully punch holes where they need to be for attaching to your bicycle. 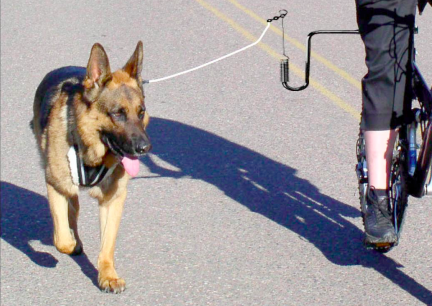 Use Zip Ties, with a little slack for tying onto your bicycle. Use Velcro or more zip ties to attach to your Rear Rack. 89. An old Rain Coat and Duct Tape. Use the pattern below for each side of your Pannier Set. 90. Shower Curtains come in many colors and Prints. 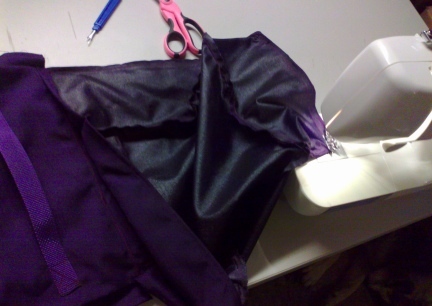 If you do not sew, that is No Sewing Required, you could use tape, Duct Tape is best, and make a set of Fancy Panniers for your Bicycle that are Water Proof. 91. Australian Horse Saddlebags are beautiful Leather Pouches individually made with leather straps for attachment to the saddle...or your bicycle. 92. English Horse Saddle Bags can be bought online and come in Leather or Cordura in a variety of colors. These, like the Aussie Saddle Bags are individual and come with Leather Straps. 93. 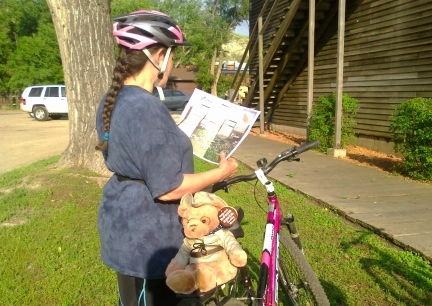 Two Stuffed Animals, or one for a Bike Bag on your Rear Rack. 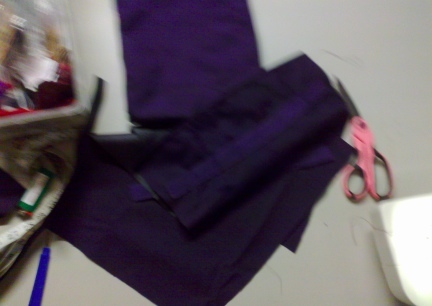 Make sure they are safe to use, no legs that can get caught into the spokes (sew them together). This is a fun and functional way to get kids excited about riding bikes with you to camp. Strip the animal of it's stuffing and use the space for items. 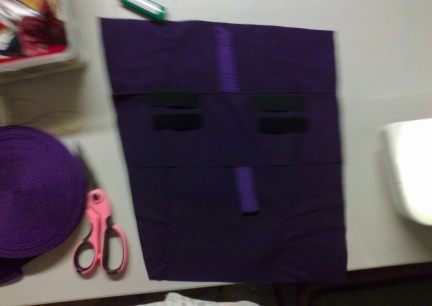 See full instructions on our 'Make Your Own Bicycle Panniers' page on this website. 94. Take two empty and washed Snack/Chip Bags and line them with Fabric. Make an appropriate sizes pouch to fit inside your Snack Bags. Glue in with Craft Glue, good for Fabrics. 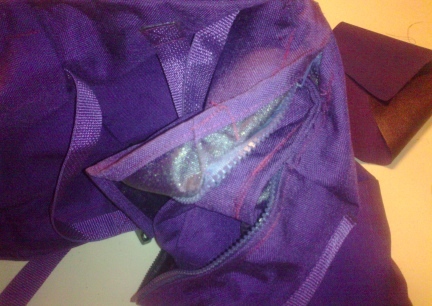 Use Press On Velcro for closures and Sew On Velcro for attachments that are well glued onto the clean bags. These might not hold much but would be real for on a short training run with friends or on a Organized City Street Ride. 95. Use the same idea as above, clean and dry Snack/Chip Bags as number 94, but instead of using fabric on the inside, use Clear thick Packing Tape on the outside. Glue velcro closure, sew on type, for the attachments. 97. Stuffed Toy Holders for children's rooms to hang on the wall...might have to size it and fold over the top. 98. Old cracked storage tubs lids and duct tape to fashion a box made into a Bike Bag or Panniers. 101. 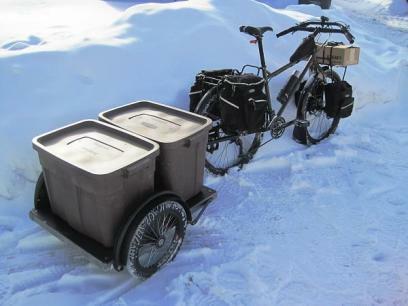 When your Panniers are too full, and your sleeping bag is piled too high, buy a Bicycle Trailer and plan more Bike Touring Trips! You will need, I recommend two matching, containers of some sort. Many people use Kitty Litter or Cat Food Buckets. These work very well and the tops shut pretty tight. If you do not own a cat, or use this type of products, look around, you might have something else that will work, or want to buy different items for the buckets. Just remember, you need Food Approved containers if you are going to carry food within. 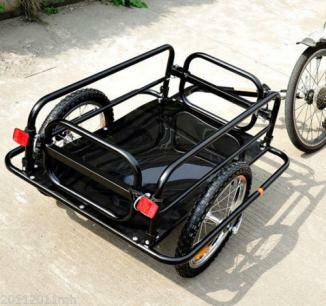 As I said above, you could just use a Tire Tube and Side Release Buckles, to attach the buckets to your bicycle. 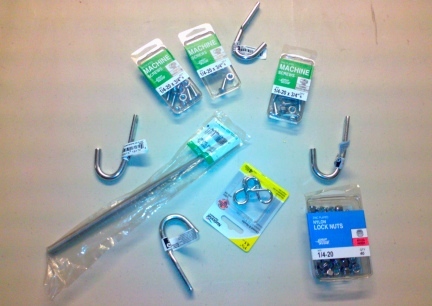 We are going to add Hooks and Springs for our project. Reflectors of some sort. You could buy the type that bolt on, or use Reflective Tape. If you use Reflective Tape, use a good amount. If you buy Reflectors that bolt on, get large ones. 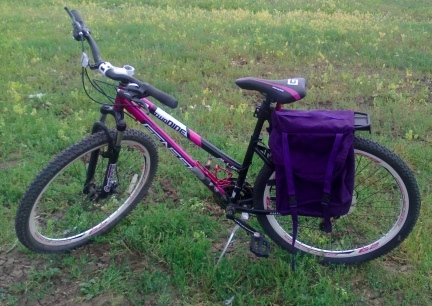 I have already been out on the Trail for over 7.5 miles and the Panniers rode well and were placed perfectly. I really like them. Information and Instructions are coming soon. SEE FAR MORE IDEAS AND INFORMATION AS WELL AS PATTERNS AND PHOTOS FOR MAKING ALL SORTS OF BICYCLE PANNIERS AND BAGS FOR YOUR BIKE AS WELL AS FOR YOUR CHILDREN'S BICYCLES ON OUR "MAKE YOUR OWN BICYCLE PANNIERS" PAGE AT THIS WEBSITE, SEE NAVIGATION AT THE RIGHT.